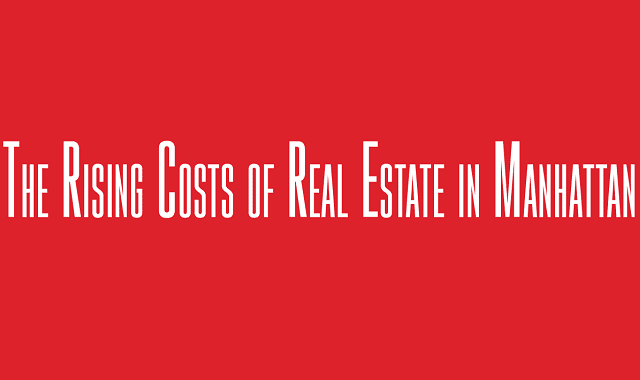 The Rising Costs of Real Estate in Manhattan #Infographic ~ Visualistan '+g+"
Most people in the US are aware that it’s incredibly expensive to live in New York City. Even so, the actual statistics are pretty shocking. For example, the cost per square foot of condominiums and co-ops in Manhattan has increased by almost 42% in the last ten years. Going back even further, housing prices in the borough of Manhattan have increased by more than 250% since 1974. That is out-pacing inflation, and in some cases, wages. As prices continue to rise, some people are finding themselves priced out of certain neighborhoods in the borough. This infographic from Central Park Bike Rental (CentralParkBikeRental.nyc) tracks the rising costs of real estate in Manhattan. It explores the average price per square foot of condos and co-ops, which neighborhoods have seen the biggest rise (and sharpest decrease) in price over the past decade, and information for renters. Readers can use this guide to help decide where in Manhattan to purchase a condo or rent a living space. Enjoy!